How would you KNOW, not suspect, infer, but have factual knowledge, that a Pope has been stripped of the office of the Papacy? When can you reasonably conclude that a reigning pontiff has committed the sin of heresy? I think the answers are rather simple. The answer to the first question is when the Church tells you. This would accomplished by a formal declaration by the authorities of the Church. The answer to the second question is when the Pope tells you. This would be accomplished by a formal declaration by the Pope followed by an action that ratifies it. In other words, he would have to explicitly deny a Dogma of the Church. This would then be followed by an action such as his abandoning his post and joining a sect or creating a new one. In these two cases, you would KNOW as a fact without the need of any judgement or inference. Until that happens, we're stuck with Pope Francis. Thus, the Sedevacantist uses (abuses) Pope Pius XII’s teaching to mean that any Pope whom they personally judge to be a heretic has automatically lost his office, because of the “nature” of the offense. Never mind that in this teaching Pius XII never addresses who judges whether the offense has been committed and what effect the offense would have on a cleric’s jurisdiction (nowhere does Pius XII or any other Pope teach that heresy, of its nature, causes a Pope or bishop to lose his office or jurisdiction). By emphasizing the “nature” of heresy, the Sedevacantist thinks he gets around the need to have the Church’s authorities involved in the process of rendering a judgment and removing a heretical Pope. Putting aside the obvious problem with their argument (Who judges whether the offense has been committed? The Church’s authorities? Or vigilante Sedevacantists with no authority? ), let’s address their Major Premise that heresy by its nature severs one from the Church. Is it true that heresy, by its very nature, severs one from the Church? The answer is yes, just as Pius XII teaches. However, Sedevacantists have failed to make a fundamental distinction between legal separation and spiritual separation from the Church. When a person knowingly rejects or willfully doubts a doctrine of the Church that must be believed by divine faith, he is guilty of the sin of formal heresy and is spiritually severed from the Church. Being separated from the Church, he no longer shares in the spiritual goods of the Church. This is because a formal heretic immediately loses the supernatural virtue of faith, along with grace and the rest of the supernatural virtues. In this spiritual sense, then, heresy by its nature does sever one from the Church, for there is a metaphysical incompatibility between faith – “the foundation of the supernatural life” - and the mortal sin of heresy. However, this spiritual separation does not automatically result in a legal separation from the Church. And that means the spiritual separation does not necessarily cause a Pope (or any other cleric) to lose his jurisdiction/office in the Church, since jurisdiction is a legal prerogative, which does not require the interior virtue of faith, or the influx of grace through the Church. This is the key point that the Sedevacantists and Pope Francis-rejecters who refer to Pius XII’s teaching in Mystici Corporis Christihave not grasped. For example, a priest who has been commissioned by his bishop to forgive sins can exercise his jurisdiction in the confessional, even if he himself is a formal heretic (i.e., has lost the virtue of faith) and has thereby severed himself spiritually from the Church. In this legal sense, then, heresy by its nature will not necessarily sever one from the Church, because there is no metaphysical incompatibility between heresy and jurisdiction (a legal matter of the external forum), like there is between heresy and the virtue of faith (a spiritual matter of the internal forum). Finally, the faith is not absolutely necessary in order that a man be capable of spiritual and ecclesiastical jurisdiction and that he be capable of exercising true acts which demand this jurisdiction…The foregoing is obvious, granted that, as is taught in the treatises on penance and censures, in case of extreme necessity a priest heretic may absolve, which is not possible without jurisdiction. The loss of faith for heresy which is merely internal does not cause the loss of the power of jurisdiction (…) This is proved in the first place by the fact that the government (ecclesiastical) would become very uncertain if the power depended on interior thoughts and sins. Another proof: given that the Church is visible, it is necessary that her governing power be in its way visible, dependent therefore on external actions, and not on mere mental cogitations. The Pope heretic is not a member of the Church as far as the substance and form [the spiritual bond] which constitute the members of the Church; but he is the head as far as the charge and action [the legal bond]; and this is not surprising, since he is not the primary and principal head who acts by his own power, but is as it were instrumental, he is the vicar of the principal head, who is able to exercise his spiritual action over the members even by means of a head of bronze; analogously, he baptizes at times by means of heretics, at times he absolves, etc., as we have already said. [O]ccult heretics are still of the Church, they are parts and members [the legal bond]… therefore the Pope who is an occult heretic is still Pope. This is also the opinion of the other authors whom we cite in book De Ecclesia. St. Robert Bellarmine’s objection. The pope who becomes a secret heretic is still an actual member of the Church, for he is still the head of the Church, as Cajetan, Cano, Suarez, and others teach. Reply. This condition is quite abnormal, hence no wonder that something abnormal results from it, namely, that the pope becoming secretly a heretic would no longer be an actual member of the Church, according to the teaching as explained in the body of the article, but would still retain his jurisdiction by which he would influence the Church [the legal bond] in ruling it. Thus he would still be nominally the head of the Church, which he would still rule as head, though he would no longer be a member of Christ, because he would not receive that vital influx of faith from Christ [the spiritual bond], the invisible and primary head. Thus in quite an abnormal manner he would be in point of jurisdiction the head of the Church [the legal bond], though he would not be a member of it. Note well that when Bellarmine, Billuart, Garrigou-Lagrange, and others speak of an “occult” or “secret” heretic, they are not only referring to a person who has committed the sin of heresy secretly in his heart. They are also referring to those who manifest their heresy by external actions, but who have not openly left the Church. One openly leaves the Church when he renounces the Church as the infallible rule of faith and chooses another rule (e.g., by publicly professing he is no longer Catholic; by joining a Protestant sect, etc.). Heretics are divided into occult and notorious. Occult heretics are, in the first place, those who by a purely internal act disbelieve dogmas of faith proposed by the Church, and after that, those who do indeed manifest their heresy by external signs, but not by a public profession [i.e., renouncing the Magisterium as the rule of faith]. Among them, you will easily understand that many men of our times fall into the latter category—those, namely, who either doubt or positively disbelieve matters of faith, and do not disguise the state of their mind in the private affairs of life, but who have never expressly renounced the faith of the Church, and, when they are asked categorically about their religion, declare of their own accord that they are Catholics. …only the notorious are excluded [from the Church], and not the occult—among whom we must also number (as it seems to us) those who, sinning against the faith even externally, have never departed from the rule of the Church’s magisterium by a public profession. Notice that a person may not only manifest his heresy by external signs, but even sin against the faith externally, yet will only be considered an occult heretic, so long as he does not “depart” from the Church as the rule of faith (or, alternatively, be declared a heretic by the Church). Thus, while such a person may have severed the spiritual bond which united him to the Church, he retains the legal bond, And that means if he is a cleric (including the Pope), he remains a lawful office holder in the Church and retains his jurisdiction. This explains why in his treatment of a heretical Pope, Bellarmine called Novatian a manifest heretic who lost his jurisdiction, but did not call Michel de Bay a manifest heretic – even though both of them publicly professed heresy. The difference between the two is that Novatian had openly left the Church, while de Bay did not. This treatment of Bellarmine is of critical importance. Michel de Bay, who lived at the time of Bellarmine, not only publicly professed heresy, but also ignored Pope Pius IV who imposed silence on him (in 1561), and continued to teach his heresies in public, even after they were formally condemned by the Pope. In other words, de Bay externalized his heresy in the public forum. As a result, one could have privately concluded from these actions that de Bay was a formal heretic (due to the evidence of pertinacity). Yet Bellarmine held de Bay to be a Catholic, because he did not openly leave the Church (nor was he declared a heretic by Church authorities). Hence, de Bay remained a legal member of the Church, and was recognized as such by Bellarmine. Novatian, however, didn’t just teach heresy like de Bay did. Rather, he openly left the Church by refusing to recognize the papacy of Cornelius who was the true Pope (just like the Sedevacantists have done with the conciliar Popes) and eventually declared himself Pope (as over a dozen Sedevacantists have also done). That is, Novatian renounced the Pope and the Church - the “social Magisterium” - as the infallible rule of faith, and chose another rule (himself, as antipope). Accordingly, Bellarmine properly called Novatian a manifest heretic who lost his jurisdiction in the Church. In the next installment, we will further explore the proper way to understand how heresy, by its nature, severs one from the Church. In the first installment of this article, we addressed the teaching of Pope Pius XII in Mystici Corporis Christi that heresy, by its nature, severs one from the Church, and learned that there is an important distinction between being severed from the Church spiritually versus being severed legally. We also learned that one who has committed the sin of heresy in his heart, and even manifests his heresy externally, remains in the Church (retaining his legal bond), if he has not openly left the Church or been judged a heretic by the Church’s authorities (even if he has spiritually severed himself from the Church by the mortal sin of heresy). And if such a person is a cleric, including the Pope, he retains his office and jurisdiction in the Church. We ended the last installment by pointing out that, in his treatment of a heretical Pope, St. Robert Bellarmine called Bishop Novatian a manifest heretic who lost his jurisdiction, but did not call Michel de Bay a manifest heretic – even though both of them publicly professed heresy. This is because Novatian openly left the Church and de Bay did not. As we said, Bellarmine’s treatment of these two clerics is of critical importance. Michel de Bay, who lived at the time of Bellarmine, not only publicly professed heresy, but also ignored the warnings of Pope Pius IV who imposed silence on him, and continued to teach his heresies in public, even after they were formally condemned by the Pope. That is, de Bay externalized his heresy in the public forum, and one could have concluded from these actions that de Bay was a formal heretic (due to the evidence of pertinacity). Yet Bellarmine held de Bay to be a Catholic in good standing, because he did not openly leave the Church (nor was he declared a heretic by Church authorities). Needless to say, none of the conciliar Popes, including Pope Francis, have been cut off by the Church’s judgment (the first way) or departed from the Church of their own accord (the second way). How is this relevant to Pius XII’s teaching on the nature of heresy in Mystici Corporis Christi? In the paragraph (no. 22) that immediately precedes the Pope’s teaching that heresy “by its very own nature” severs one from the Church (no. 23), the Pope affirms with Bellarmine and Driedo that the legal separation (as opposed to a spiritual separation) would only occur if one would openly leave the Church (separating from the unity of the Church) or be expelled by the Church’s authorities. Pius XII says: “Actually only those are to be numbered among the members of the Church who have received the laver of regeneration and profess the true faith and have not separated themselves from the unity of the body or been excluded by legitimate authority.” What this shows is that while heresy by its nature severs a person from the Church spiritually, the legal separation does not take place unless the person openly leaves the Church, or is cut off by the Church’s judgment. I say that manifest heretics, unless they are denounced by name, or themselves depart from the Church, retain their jurisdiction and validly absolve. This is proved by the Bull of Martin V (…) Our argument is confirmed by the current praxis of the entire Church; for no one today ... avoids his pastor, even for the reception of the sacraments, as long as he is allowed to remain in his benefice, even if the man is, in the judgment of all or at least of the majority, a manifest Jansenist, and rebellious against the definitions of the Church; and so on with the rest. I have said in my thesis, “unless they depart from the Church of their own accord”; for, by the fact that they depart from the Church, they renounce her jurisdiction, and as a result we infer that the Church does not continue to give it to them. What this means is that if a cleric, including the Pope, publicly professes heresy, but has not been judged a heretic by the Church (the first way), or openly left the Church (the second way), then he would “legally” be considered only an occultheretic only (and that only if he committed the sin of heresy). And it is the unanimous opinion of the theologians that occult heretics retain their clerical offices and jurisdiction in the Church, because they retain their legal bond to the Church, even if they have severed the spiritual bond. That means the conciliar Popes, who have neither been judged heretics nor departed from the Church by openly leaving her, are true and lawful Popes – even if they were spiritually separated from the Church. A related point that needs to be explained is the meaning of the phrase “profession of the true faith” (which is one of the external bonds of unity with the Church), since virtually all Sedevacantists and Francis-rejecters misunderstand what this means. They mistakenly believe that if a Catholic makes a heretical statement, then he no longer “professes the true Faith” and hence immediately ceases to be a member of the Church. And if the person in question is a Pope, they conclude that he immediately loses his office. This error is rooted in an incomplete understanding of this external social bond of unity, and how the bond is severed. In his acclaimed book, The Church of Christ, Fr. E. Sylvester Berry explains that “profession of faith” is realized by the external and public submission to the Church’s teaching authority – what Cardinal Billot calls the Church’s “social magisterium.” This external bond of unity does not require that all the dogmatic teachings of the Magisterium be publicly professed with theological precision, nor is the bond severed by the public profession of an erroneous or even heretical doctrine. In other words, what is absolutely necessary for this bond to be preserved is the external submission to the Church as the rule of faith, not the perfect understanding and profession of all of her dogmas. We can further clarify this point by distinguishing between the formal and material aspects of the bond. The formal and essential aspect of the “profession of faith” is submission to the Church’s teaching authority; the material aspect is the understanding and material profession of doctrine. The material aspect can be perfect (i.e., when each doctrine is held and professed with theological precision) or imperfect (i.e., when there is an admixture of error or even material heresy). Since the material aspect of this bond does not require perfection for the bond itself to remain intact, we can understand why Fr. Berry would say that “the profession of the faith practically resolves itself into submission to her teaching authority” – which is the formal aspect of the bond. …for, although heresy separates one from the Church by its very nature, nevertheless, this separation is not thought to have been made, as far as we are concerned (quoad nos), without that declaration. Likewise, we respond to his [i.e., Bellarmine’s] reasoning in this way: one who is not a Christian, both in himself (quoad se) and in relation to us (quoad nos), cannot be Pope; however, if in himself he is not a Christian (quoad se), because he has lost the faith, but in relation to us (quoad nos) has not yet been juridically declared as an infidel or heretic (no matter how manifestly he be such according to private judgment), he is still a member of the Church as far as we are concerned (quoad nos); and consequently he is its head. It is necessary, therefore, to have the judgment of the Church, by which he is proposed to us as someone who is not a Christian, and who is to be avoided; and at that point he ceases to be Pope in relation to us (quoad nos); and we further conclude that he had not ceased to be Pope before [the declaration], even in himself (quoad se), since all of his acts remained valid in themselves. According to this theological explanation, a Pope who falls into heresy ceases to be united to the Church quoad se (of himself), but he remains united to the Church quoad nos (according to us), until the separation is legally recognized by the Church. And by remaining “a member of the Church quoad nos” (according to us), he remains Pope, not only quoad nos(according to us), but even quoad se (of himself). In other words, as long as a heretical Pope is considered a legal member of the Church, and hence the true Pope quoad nos (according to the Church’s judgment), he remains a true and valid Pope quoad se(of himself) as well. The legal separation from the Church is actualized when the Church’s authorities externally recognize the separation (by publicly judging that the subject is a heretic or has openly left the Church). In the case of the Pope, note that it is Christ Himself Who severs the bond between the heretical Pope and the papacy (since the Church has no authority over the Pope), and He will not do this in secret, without the Church knowing about it. This is why Christ can continue to give jurisdiction even to a manifestly heretical Pope as long as he is being recognized by the Church as its head. 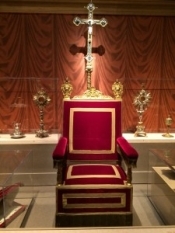 It is possible for Christ to sustain a heretical Pope in office because the relationship between heresy and jurisdiction is not one of total metaphysical incompatibility, and Christ will do so because He will not secretly depose a Pope while he is being tolerated by the Church and publicly recognized as its head. Observe, however, that, though we affirm that the Supreme Pontiff, as a private person, might be able to become a heretic and therefore cease to be a true member of the Church [spiritually/quoad se] still, while he was tolerated by the Church, and publicly recognized as the universal pastor, he would really enjoy the pontifical power [legally/quoad nos], in such a way that all his decrees would have no less force and authority than they would if he were truly faithful. The reason is: because it is conducive to the governing of the Church, even as, in any other well-constituted commonwealth, that the acts of a public magistrate are in force as long as he remains in office and is publicly tolerated. This, of course, makes perfect sense. For if God were to secretly sever the bond uniting the man to the pontificate, while the Church continued to recognize the man as Pope, the actions of God would effectively deceive His Church into following an antipope – that is, one lawfully elected and publicly presented to the Church as Pope by the authorities, yet secretly deposed by God. Needless to say, such a thing is impossible, for God cannot lie or deceive us. Thus, heresy, by its nature, severs one’s spiritual bond with the Church, but not his legal bond, until it is recognized as such by the Church’s authorities. Mystici Corporis, No. 23, June 29, 1943. De Fide, disp. 10, section 6, nn. 3-10, p. 317 (emphasis added). De Legibus, lib. IV, ch. VII, n. 7, p. 360 (emphasis added). De Fide, disp. 10, section 6 nn. 3-10, p. 317 (emphasis added). Bouix, Tract on the Pope, Tom. II, p. 662 (emphasis added). De Romano Pontifice, bk. 2 (emphasis added). Christ the Saviour, A Commentary on the Third Part of St. Thomas’ Theological Summa, at http://www.thesumma.info/saviour/saviour37.php (emphasis added). Ibid., p. 293 (emphasis added). Ibid., p. 294 (emphasis added). Cardinal Billot explains that “The notion of heresy… includes another element: departure from the social magisterium, which was divinely constituted to be the authoritative organ for the proposal of revealed truth in Christian society” (Billot, Tractatus de Ecclesia Christi, vol. I, Q. 7: “On the Members of the Church”). De Romano Pontifice, bk. 2, ch. 30 (emphasis added). Ioannis Driedonis, De Ecclesiasticis Scripturis & Dogmaticos, book 4, Eccles, cap. 2, p. 2., p. 517. Billuart, Summa Sancti Thomae Hodiernis Academiarum Moribus Accommodata, Secunda Secundae, 4th Dissertation: “On the Vices Opposed to Faith,” Art. 3. In the case of a Pope, the Church judges him indirectly, rather than directly, by performing the ministerial functions necessary to establish that he is pertinacious in rejecting a defined dogma. The Church of Christ, p. 126. The Catechism of the Council of Trent, p. 96. The Church of Christ, p. 128. Cursus Theologici II-II, John of St. Thomas, De Auctoritate Summi Pontificis, Disp. II, Art. III, De Depositione Papae, p. 139 (emphasis added). Or, to use Bellarmine’s terminology, God alone knows who are united to the Soul of the Church. Christ’s Church, p. 242 (emphasis added). Using Thomistic terminology, we can also say the legal separation from the Church due to occult heresy is in potency, but not in act. Summa, in C. 24, q. 1. p. 100. Peter Huizing, The Earliest Development of Excommunication latae sententiae,” Studia Gratiana 3 (1955), p. 286.